On October 14th Flourish will be releasing a collaborative album on behalf of Hope Mommies, an organization whose sole purpose is to come alongside moms and families who have experienced infant loss, bringing comfort, encouragement, companionship, and hope as they continue to walk this side of eternity without their beloved son or daughter. Flourish is providing 2,500 physical copies to Hope Mommies chapters nationwide at no cost. We would love to see Redeemer support the project/Hope Mommies/Flourish by helping raise $750 through the process to help cover costs and allow for more albums to be sent out to Hope Mommies. Buy an album for a friend you know has lost a beloved child to support them. We will have albums available at our gathering Oct 14th & a donation box set up at our gatherings through the month of October. Main Idea - The scriptures invite us to receive the Word of God as our authority which will challenge our previous thinking and assumptions. Listen to the sermon audio here. You can also checkout more resources for this series HERE. What are some common beliefs you or the people around you hold? Where did these ideas come from and what is the basis for their authority? Take a minute to read and consider 1 Thessalonians 2:13. What observations do you have about this verse? What keeps jumping out to you? What does the Apostle Paul mean when he refers to the “word of God”? How does the word of God challenge each and every person? What does it mean to have a Gospel-centered understanding of the scriptures? How does it change the way we read the scriptures if we understand it as a larger story with Jesus as the hero? What part of the scriptures are still difficult for you to embrace as “authoritative”? 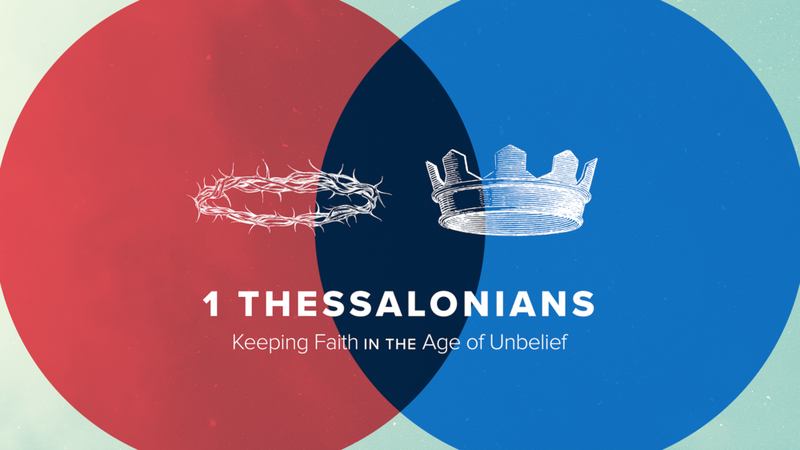 Reflect on what we have read so far in 1 Thessalonians chapters 1 and 2. How has the scripture challenged you personally? What sin in your heart might need to be confessed? What good news about God’s grace might you need to receive? Main Idea - Leadership is such an important part of healthy Gospel-centered churches but many of us have experienced hurtful leadership. Gospel leadership is a new way of understanding leadership. Gospel leaders suffer so that others may flourish, are motivated by the approval and will of God, and lead through a shared life. Listen to the sermon audio here. How has the use of power in leadership been a source of pain for you in the past? How might this affect your present view of authority or leadership? What are some poor motivations for leading or influencing others? How can you relate to this in your unique areas of leadership. Gospel leadership flows from a shared life which creates the context for connection, instruction, and correction. Consider this statement in light of 1 Thess. 2:7-8. In what ways have you experienced this kind of leadership in your life? What ways do you long to experience this more? How might you apply this to the people God has put in your life to lead? Why is it important that instruction and correction happen within the context of shared life? What happens when you have shared life but there is no instruction or correction? How might God be at work to help you rethink leadership? What implications would that have for your life and your MC/DNA life together? Foster Village has been BUSY ever since we began operating out of Redeemer in January of this year. Rarely has a week gone by where we haven’t fulfilled at least 2 requests! What a joy it has been to serve these foster families! Here are a few events and service opportunities we have coming up in October and November that I want to bring to your attention. Throughout the month of October – we will have running Socktober! We are heading into a time of high demand for socks, underwear, and warm pajamas. We will also be taking monetary donations to directly serve our community with these needs. Donation drop-off can be located in the foyer of Redeemer starting October 1. Two more dates to put on your calendar – October 20 and November 10. October 20th we will be switching out our entire inventory of clothing from summer to fall/winter and could use lots of extra hands! We will be up there all day so please feel free to come and go as your time allows. November 10th we will be cleaning out the garage at the office/house next door. Along with putting up some shelving to better organize and store our beds and mattresses. Please bring some tools and brooms and let’s knock it out! We do also have a Christmas project in the works as well - stay tuned for details! If you have any questions or would like to know more about how to get involved with Foster Village – please feel free to email me! Main Idea - Keeping faith in the age of unbelief is challenging and often seems hopeless. Although the church has often contributed to this difficulty, participation in the Gospel-centered church remains the primary means by which God preserves our faith. What is the main story behind Paul’s letter to the Thessalonians? Who is he writing to and what are his primary concerns? Why is membership in a local and the universal church important? How does understanding Paul’s letters written to churches (rather than individuals) change the way we understand and apply them? What are some of the ways that the church (locally and universally) has departed from the Gospel and corresponding way of life? How has this contributed to people losing faith? How have you experienced this? What are the characteristics of a church that Paul thanks God for in 1 Thessalonians 1:1-10? How do these compare with your own metrics for what a church should be? What aspect of Paul’s instructions seem most needed in your life? Read 1 Thessalonians 1:9-10 again slowly. Keeping faith means that we as a church community and individuals have turned from idols to worship the Triune God. This happened when we first believed and we continue to live with ongoing repentance and faith. Share your story of how God led you to turn from idols to worship Him. What are the present idols that God might be leading you to turn away from in repentance and trust in Jesus again? Why is ongoing repentance and faith needed as we await Jesus to return and make all things new?